Barcor Countersink Gages are perfect for measuring the top diameter of a countersink bore. 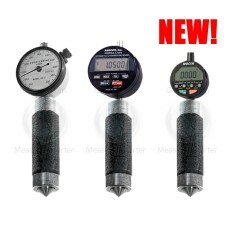 Boasting 1 rev, direct reading convenience the analog Countersink Gage requires a master to set the gage (included), and has a cone that is cut to a specific angle. Choose from analog/digital and inch/metric. Barcor is our #1 choice in Countersink Gages. Click on any picture to see the range of models available. The BARCOR COUNTERSINK GAGE is a precision instrument designed specifically to measure the top (major) countersink diameter. Simply press the spring loaded, exact angle Gaging Plunger into the countersink and read the dial directly in .002" or 05mm diameter increments on the dial face. The COUNTERSINK GAGE is a simple yet powerful, direct reading gage. It reads the actual dimension as called out on your print. 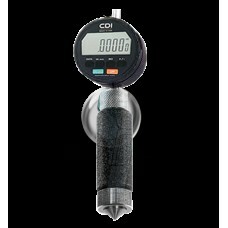 This gage gives you fast, accurate, and repeatable readings on the shop floor or in the Gage Room. Virtually foolproof, even the inexperienced can use the COUNTERSINK GAGE with reliable results. Full-round, conically ground, exact (dedicated) angle Gaging Plunger instantly alerts operator of incorrect countersink angle. Base Plate of all gages designed for use on any flat, concave, or convex surface. "Peak Hold” mechanism, standard on all Models, allows for one-hand operation. 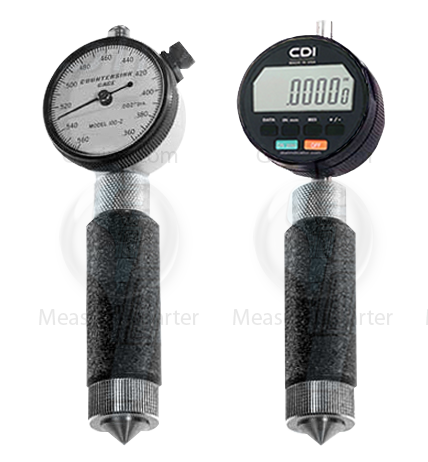 Every dial gage furnished with a functionally calibrated Setting Ring and a foam lined Storage Case with complete Operating Instructions. Optional Solid Carbide Gaging Plunger, with Lifetime wear guarantee, available on all Models. Optional NIST Certificate - Letter of Certification also available. ALL sizes are available see the links below for gages available for purcahse online. If there is something you would like quoted call (888)978-9873 or email sales@gaging.com. 30º and 60º versions are now available as digital only. 30-0 30° .020" to .170"
30-1 30° .160" to .360"
30-2 30° .360" to .560"
30-3 30° .560" to .780"
30-4 30° .780" to .980"
30-5 30° .980" to 1.180"
60-0 60° .020" to .170"
60-1 60° .160" to .360"
60-2 60° .360" to .560"
60-3 60° .560" to .780"
60-4 60° .780" to .980"
60-5 60° .980" to 1.180"
82-0 82° .020" to .170"
82-1 82° .160" to .360"
82-2 82° .360" to .560"
82-3 82° .560" to .780"
82-4 82° .780" to .980"
82-5 82° .980" to 1.180"
90-0 90° .020" to .170"
90-1 90° .160" to .360"
90-2 90° .360" to .560"
90-3 90° .560" to .780"
90-4 90° .780" to .980"
90-5 90° .980" to 1.180"
100-0 100° .020" to .170"
100-1 100° .160" to .360"
100-2 100° .360" to .560"
100-3 100° .560" to .780"
100-4 100° .780" to .980"
100-5 100° .980" to 1.180"
110-0 110° .020" to .170"
110-1 110° .160" to .360"
110-2 110° .360" to .560"
110-3 110° .560" to .780"
110-4 110° .780" to .980"
110-5 110° .980" to 1.180"
120-0 120° .020" to .170"
120-1 120° .160" to .360"
120-2 120° .360" to .560"
120-3 120° .560" to .780"
120-4 120° .780" to .980"
120-5 120° .980" to 1.180"
130-0 130° .020" to .170"
130-1 130° .160" to .360"
130-2 130° .360" to .560"
130-3 130° .560" to .780"
130-4 130° .780" to .980"
130-5 130° .980" to 1.180"
INSTANTLY MEASURE COUNTERSINK DIAMETERS The 130-0 130º Barcor Countersink Gag..
INSTANTLY MEASURE COUNTERSINK DIAMETERS The 130-1 120º Barcor Countersink Gag..
INSTANTLY MEASURE COUNTERSINK DIAMETERS The 130-3 130º Barcor Countersink Gag..
INSTANTLY MEASURE COUNTERSINK DIAMETERS The 130-4 130º Barcor Countersink Gag..
INSTANTLY MEASURE COUNTERSINK DIAMETERS The 130-5 130º Barcor Countersink Gag..
INSTANTLY MEASURE COUNTERSINK DIAMETERS The 100-0 100º Barcor Countersink Gag..
30º and 60º versions are now available as digital only. MOD..
INSTANTLY MEASURE COUNTERSINK DIAMETERS The 100-2 100º Barcor Countersink Gag..
INSTANTLY MEASURE COUNTERSINK DIAMETERS The 100-3 100º Barcor Countersink Gag..
INSTANTLY MEASURE COUNTERSINK DIAMETERS The 100-4 100º Barcor Countersink Gag..
INSTANTLY MEASURE COUNTERSINK DIAMETERS The 100-5 100º Barcor Countersink Gag..
INSTANTLY MEASURE COUNTERSINK DIAMETERS The 110-0 110º Barcor Countersink Gag..
INSTANTLY MEASURE COUNTERSINK DIAMETERS The 110-1 110º Barcor Countersink Gag..
INSTANTLY MEASURE COUNTERSINK DIAMETERS The 110-2 110º Barcor Countersink Gag..
INSTANTLY MEASURE COUNTERSINK DIAMETERS The 110-3 110º Barcor Countersink Gag..
INSTANTLY MEASURE COUNTERSINK DIAMETERS The 110-4 110º Barcor Countersink Gag..